taller, crème and ruddy red body. It was startling how fast he shifted; but he was an alpha, and that trait was common among alphas. He discarded the sheet to the floor and stepped to me on enormous, shaggy paws. Victoria Barrows does an excellent job with her debut novel. 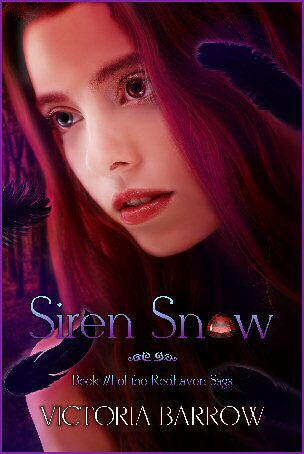 Siren Snow is a fantastic tale for all readers. 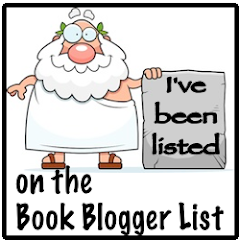 Ms. Barrows style and story will keep you entertained and amazed at her imagination. Lucy is a the resident Witch-Warden of Washington State and when something evil her way comes, things are about to get more complicated that Lucy ever imagined. Lucy is a quarky character that I really adored. She knows what she knows and isn't afraid to admit the things she doesn't know. But she never seems to let anything stand in her way. While she may 'spazz' about things on occasion, she still steps up and attempts things anyway. 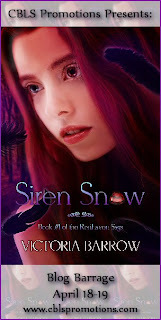 Overall, Siren Snow is a great introduction to a seven part series that any reader can pick up and enjoy. While at times Siren Snow seemed a little slow, everything really flowed well. It is easy to empathize with Lucy and her stuggles to save the Siren that was affected by the first major issue Lucy has had to face as a Witch Warden. Prizes are (5) Autographed Copies of “Siren Snow” (1 each to 5 winners). Contest is tour-wide and ends Apr 24. Must be 18 years of age or older to enter.